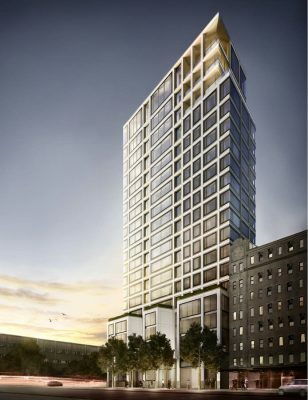 New York, NY March 19, 2014 – Scott Resnick and Brown Harris Stevens are pleased to announce the opening of the sales office for 551W21, the new 19-story luxury condominium in West Chelsea by internationally renowned architect Foster + Partners. Designed by Lee Mindel of Shelton, Mindel & Associates, the sales office meticulously presents the signature interior elements of Foster + Partners’ building design. Visits are by appointment. 551W21’s sales office is unlike a typical office, it feels like an inviting home with spectacular views of the Hudson River and the New York skyline. Located on the 20th floor in a tower in West Chelsea, the space was conceived to showcase and highlight the warmth of the interiors and the sumptuous details of a typical residence in 551W21, a building with a contemporary feel and inspired by the generously-scaled pre-war homes customary to Park Avenue and the Upper East Side. It also realistically conveys the luxurious qualities, details of security, and sense of scale offered by Foster + Partners’ plan, including a large section of the curtain wall, 11-foot ceiling heights and window spans that are elegantly proportioned to capture the expansive views. Lee Mindel presents the true proportions of the rooms in the large-scale residences in 551W21, including the grand room, kitchen, dressing room and master bathroom. Its floor plan is thoughtfully designed to articulate the progression through space of an actual residence; from the entry hallway into the grand room, from the dressing room through double doors into the spacious master bathroom. 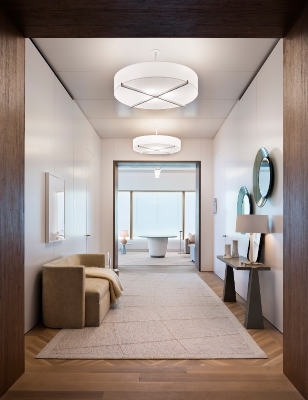 Mindel considered every aspect of the sales office to reflect a range of the 551W21’s exceptional characteristics. In a nod to the building’s contemporary aesthetic and highest levels of craftsmanship of the interior elements, he selected a thoughtful mix of custom furnishings – such as a modified version of a Rockefeller sofa – with classic modernist works to express the voice of the building without losing the formality of the space. Also incorporated are oak herringbone floors and the four rugs handmade by V’Soske are a continuous graphic of the longitude and latitude and as center of the composition of the site. Specially produced textiles of gold and titanium hues, capture and reflect the dramatic light of the location and reference 551W21’s window frames made of luminous metal. This offsite collage is perched high above the actual construction site two blocks south, so that the building of the building becomes an art piece itself. Design in the sales office include furnishings and objects by Alvar Aalto, Billy Baldwin, Fontana Arte, Patrick Norguet, V’Soske, along with various components by Foster + Partners. 551W21 Sales Office is located on the 20th floor of the Chelsea Arts Tower and overlooks the building site at 551 West 21st Street. An outdoor space offers a view of the building’s progress. Founded by Scott Resnick, SR Capital is a real estate firm whose executives have 70 collective years of development, construction, investment and project management expertise. Resnick previously served as President and Chief Operating Officer of Jack Resnick & Sons, Inc., where he developed several buildings including 200 Chambers Street: a 400,000 square foot, 258-unit condominium in TriBeCa. He serves on the Board of Governors of the Real Estate Board of New York and is a Trustee of the Whitney Museum of American Art. Resnick chairs the Whitney’s New Building committee, overseeing development of its $400 million, 200,000 square foot building in the Meatpacking District designed by Renzo Piano. In addition to having designed the iconic Hearst Tower on Eighth Avenue, Foster + Partners’ current New York City projects include the Public Library on Bryant Park and a new development at 425 Park Avenue. Over the past four decades, the practice has pioneered a sustainable approach to architecture through a strikingly wide range of work. Based in London with offices worldwide, Foster + Partners is one of the most innovative architecture and integrated design firms in the world today. Since its inception in 1967, it has received more than 620 awards for excellence and won more than 100 national and international competitions. Beyer Blinder Belle Architects & Planners is an international, award-winning architecture, planning and interiors practice with a demonstrated commitment to design excellence, social integrity and sustainable practices. Notable projects include restorations of New York City Hall and the Empire State Building’s Public Lobbies, 100 11th Avenue with Ateliers Jean Nouvel and The Carlton House. GTIS Partners is a global real estate investment firm headquartered in New York City with offices in Los Angeles and São Paulo. GTIS Partners has 65 employees and currently manages approximately $2.4 billion of committed equity. To date, the firm has committed capital to residential, retail, industrial, office, hotel and mixed-use projects in the U.S. and Brazil, including 55 projects in the U.S. residential sector. Brown Harris Stevens Development Marketing specializes in the planning, marketing and sale of best-in-class residential developments and conversions. Established in 1873, Brown Harris Stevens is the premier provider of residential real estate services in Manhattan. The firm has offices throughout New York City, The Hamptons, North Fork and Palm Beach. Brown Harris Stevens offers more luxury residential exclusives than any other Manhattan firm, and serves as exclusive affiliate of Christie’s International Real Estate, Inc., a subsidiary of Christie’s International PLC, the world’s oldest fine arts auctioneer. Lee F. Mindel, FAIA, is a founding Partner of Shelton, Mindel & Associates. The firm’s portfolio includes international commercial and residential architecture and interior deisgn, as well as brand identity, planning and product design for Knoll, Waterworks, Jack Lenor Larsen, Nessen and V’Soske. Mr. Mindel has been inducted into the Fellowship of the American Institute of Architects, the Interior Design Hall of Fame, and is a member of the AD100. The firm has been the recipient of over 30 AIA, 11 Chicago Athenaeum and 20 SARA awards, and was the 2011 winner of the prestigious National Design Award by the Smithsonian Cooper Hewitt. Rizzoli’s “Shelton, Mindel & Associates Architecture and Design,” a monograph of the firm’s residential work, has received universal critical acclaim.